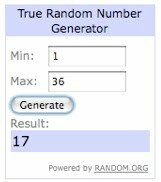 another very Lovely Give Away! which always makes me so happy when visiting! Mykonos' shop is very diverse. and comment with your favorite item. and comment with the link. what you'd like to create with the price! for a bigger chance to win! Oh, it is all so beautiful! 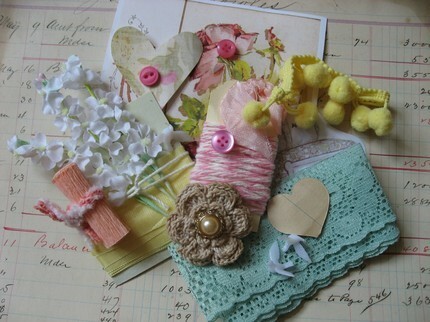 I think I would have to pick the 'Green fairy sweet shabby chic goodies kit', it is so adorable! wow her shop has such a variety of beautiful items! 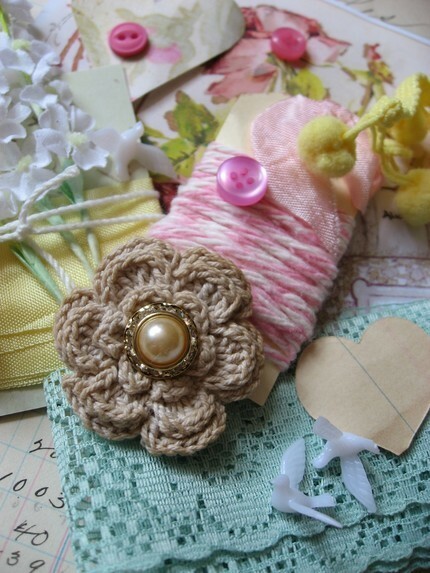 i love the Romantic beauty crafting tag! *tweet tweet* I twittered about this giveaway to my followers! I think the Flori necklace is my favourite. I would love to wear something like this! My favorite is the Lovely sewing machine and scissor necklace! I love the flying hummingbird necklace! Omgoodness I would put all of this adorable stuff to good use! It's so cute! i love all the laces and trims! I really love the love is blind necklace...the little metal envelope is adorable...but the Rosie bridal necklace is also amazing...I freaking LOVE pearls!!! i love the fairy sweet shabby chic goodies kit.. so so cute! i would love to use some of this stuff to make jewlery or headbands! I'd love to make a flowery hairpiece with the price! I love to put flowers and other things like lace in my hair. The white flowers could make a beautiful hairpiece, almost Geisha-like, together with the small pompoms. And I'm sure my creativity would flow on after that. 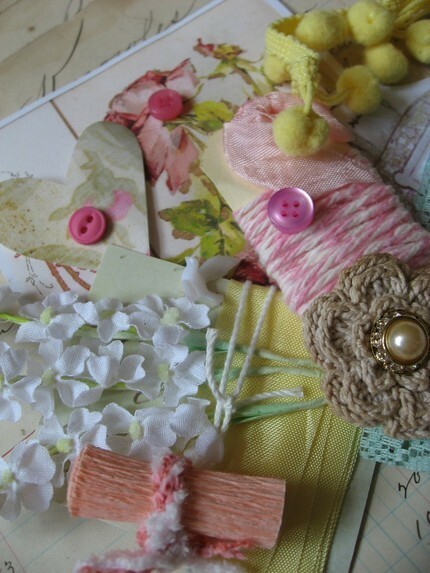 I would make a pretty necklace with all these goodies for my friend in California. This is such a beautiful collection. A very lucky girl will be very happy. Isn't it the small things in life that give such pleasure. to make cute packages, for my sales or some gift to some friends! I'd love to frame these. tough choice...this is truly amazing. I love the Romatic lace and trim crafting set, but as well the cute birds and hearts mobile. What i exactly would make, dont know, but I like to make things for friends b-days etc and this is something that I would love to use for that! blogged about it as well!! Hmm.. I love the "forest love necklace" and all the laces and trims are lovely too. There is so much to choose from in this shop! The darling wallpaper is certainlty one of my favorites! I would use the prize to decorate my office....and perhaps the office of some friends as well! My favourite item from her webshop is the 'Sweetest birds and hearts mobile'. I think it's wonderful you see the love it's made with! What I want to create with this price. I think I would use it to make lovely postcards to send for postcrossing.